Benjy Blatman, the attendance coordinator at P.S. 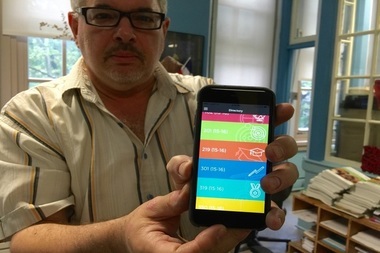 125, shows the Kinvolved app on his mobile phone. HARLEM — After two years, an app aimed at beating truancy is reaping reward. Kinvolved lets teachers and parents keep tabs on absenteeism is being used in West Harlem schools. Users swipe to say if students are at school or not. The app sends messages via text message to parents keeping them informed of their children's attendance record and class performance. Local educators have praised the app’s ability to give real-time attendance, tardiness and class performance information to parents which they said improves students’ academic performance. P.S. 125 in Harlem, on West 123rd Street, was selected as a pilot school for the technology during the 2014-2015 year by the West Harlem Development Corporation, which worked with schools to fund and incorporate the app’s use. The mobile application was developed by Kinvolved Inc. in 2012 with one school and has since grown to be used in 100 countrywide. Last year, it sent its 500,000th message, according to the company's website. The app's creators told DNAinfo two years ago it saw a 5 percent increase in the first seven months at P.S. 125. The app allows teachers to see attendance trends as well as instruction time lost, send student achievements and schoolwide notices. Higgins said his school’s attendance rate was hovering around 89 percent prior to the app’s implementation last school year. It's up to 91 percent. “Having an attendance rate at 89 percent was a hurdle for us,” he said. Higgins said the school has also partnered with nonprofits and other groups through the local development corporation to provide arts and sports programs for students to help improve attendance. “We’re a district that is considered at-risk and low-performing,” Higgins said. District wide, Harlem schools have seen improvements in truancy levels. There is a citywide attendance average of about 92 percent, according to 2015 data from the city Department of Education. In the same data, District 5, which includes P.S. 125, had an average of roughly 90 percent, an improvement from two school years prior when the district had an average of 88 percent. Other Harlem schools within the district that use the app, such as Renaissance Leadership Academy on West 129th Street and P.S. 161 on West 133 Street have seen, on average, a 4 percent improvement in attendance over the last two school years. Gale Reeves, the district superintendent, cited a community wide effort to improve curriculum and provide additional resources, but also the app’s widespread use. “If we see some trends it’s a way of telling a parent, ‘This is a way we can assist you,’” she said.